Pooley Bridge is a small, picturesque village at northern end of Ullswater, close to the mouth of the River Eamont. 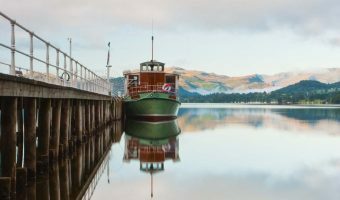 It was once a substantial fishing and farming community but now mainly caters to tourists wishing to explore the area around Ullswater and Penrith. Accommodation in Pooley Bridge itself is rather limited, with just a few pubs and guesthouses offering a handful of rooms. Most visitors stay at one of the well-equipped camping and caravan parks found on the outskirts of the village. 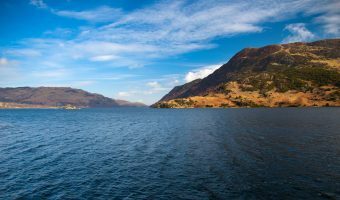 Ullswater Steamers offer cruises on the lake throughout the year. Boats sail from Pooley Bridge for Glenridding, calling at Howtown on the eastern shore. In the summer there are nine departures a day from Pooley Bridge. The pier is situated on the B5320, around 1/3 mile from the centre of the village. Visitors wishing to take to Ullswater themselves can rent a motor boat, rowing boat or kayak from Lakeland Boat Hire. The company is based at the mouth of the River Eamont, just west of the village and near the Eusemere car park. Attractions just a short drive from Pooley Bridge include Aira Force, Gowbarrow Park, Dalemain House and Gardens, Rheged, and Lowther Castle. Brochures, maps, and travel and tourism information for all these attractions and more can be obtained from the Pooley Bridge Tourist Information Centre. Park Foot is a large camping and caravanning site that enjoys a picturesque setting by Ullswater. It caters not only to caravans and tents, but also offers self-catering accommodation in a range of lodges, log cabins, and holiday cottages. Its extensive facilities include toilet and shower blocks, a laundry room with washing machines and dryers, two children’s playgrounds, a tennis court, mountain bike hire, pony trekking, and dog walking area. It also boasts a country club offering a licensed bar and restaurant, live entertainment, kids’ disco, plus bingo, karaoke, and quiz nights. The onsite store sells a wide range of groceries, camping and caravanning equipment, outdoor clothing, outdoor toys and games, and newspapers and magazines. Park Foot is situated ¾ mile south of Pooley Bridge. Waterside House Campsite is just south of Park Foot and right on the shore of Ullswater. It boasts a wide range of facilities such as electric hook-ups, showers and toilets, a laundry, adventure playground, shop, burger bar, boat launch and storage, rowing boat and canoe hire, and mountain bike rentals. Only tents and motorhomes are allowed here. Waterfoot Park is a family-orientated caravan site within easy walking distance of Pooley Bridge. Situated in the grounds of a Georgian mansion it offers a toilet and shower block, washing and laundry facilities, and a large children’s playground and games area. The reception is situated within the mansion and sells basic products and gas canisters. There’s also a bar here and a family lounge with a pool table and darts board. All touring pitches boats electric and TV hook-ups. Waterfoot Park is situated just off the A592, just ¼ mile from Ullswater and ¾ mile from the village. To get to Pooley Bridge from the M6, leave the motorway at Junction 40 and follow the A66 west. After driving for 1 mile turn left at the roundabout onto the A592. After 3½ miles, where the road meets Ullswater, turn left onto the B5320. Pooley Bridge is just half a mile down the road. To get to Pooley Bridge from Windermere/Bowness simply follow the A592 north. Just before the end of Ullswater turn right onto the B5320. The nearest car park to the centre of the village is the Lake District National Park Authority Eusemere car park. The pay-and-display car park is situated off Heughscaur Close, on the western side of the village and close to the bridge over the River Eamont. Owners of satellite navigation systems can use the postcode CA10 2NE to find it. Just over the bridge is the Dunmallard car park. This is also operated by the Lake District National Park Authority. It’s the nearest car park to the Ullswater Steamers pier. The 108 service from Penrith train station to Patterdale (the Patterdale Bus) calls at Penrith bus station, Pooley Bridge, Gowbarrow, Aira Force, and Glenridding. Pooley Bridge is 6 miles from Penrith train station and 21 miles from Windermere train station. Ullswater is one of the prettiest lakes in the Lake District. 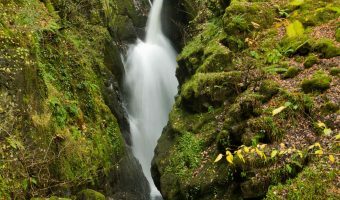 The most famous waterfall in the Lake District.